The Army was looking for systems that improved upon the Shadow UAS’ performance, particularly better acoustics (Shadow sounds like a flying lawn mower) and runway independence (Shadow relies on a runway to take off and an arresting device to land), according to Rugen. Martin UAV and Northrop Grumman Technology Services (NGTS) have entered into a teaming agreement to bring the world’s first ducted fan vertical takeoff and landing (VTOL) tactical UAS (TUAS), the “V-BAT”, to the United States Army. In concert with the Army’s renewed focus on rapid innovation and deployment of truly tactical, runway and equipment independent UAS, NGTS will enter the FTUAS with perhaps the most unique and capable VTOL TUAS in production today. “The Northrop Grumman – Martin UAV Team brings an elite capability to the forefront of this competition”, said retired Col. Heath Niemi (USA (R)), Vice President of Global Sales & Development for Martin UAV. “In nearly 27 years in the UAS Army, I have never seen a system so perfectly suited to meet the needs of the Warfighter. The Martin UAV V-BAT is commercially developed to fill critical operational needs in genuine, tactical and confined environments with a near-zero footprint – “equipment independent”. 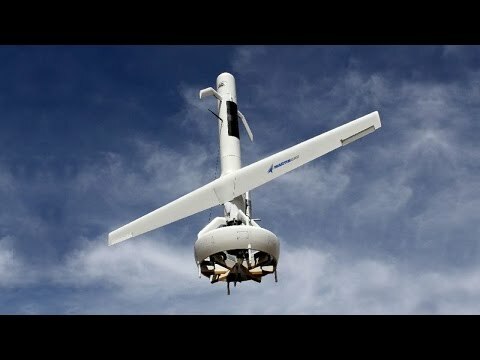 The safest tactical UAS in the space, the V-BAT is the only single-engine, ducted fan VTOL that has the ability to take off and land from a hover in a confined area, fly more than 8 hours in horizontal flight and make mid-flight transitions to “hover & stare” at any time throughout a given mission set. Martin UAV’s V-Bat demonstrates ability to precisely, repeatedly land autonomously in 8×8 ft area from hover several hundred feet above landing spot. Martin UAV’s tail sitting VTOL Fixed Wing UAV, the V-Bat, demonstrated the ability to precisely, repeatedly land autonomously in an area less than 8 ft x 8 ft from a hover several hundred feet above the intended landing spot. Then V-Bat demonstrated the same capability while landing on the back of a 2.5 ton truck as it drove along the road. The precision landing demonstration was part of a series of tests conducted at Yuma Proving Grounds in support of a development contract between Martin UAV and the Naval Air Systems Command. On the afternoon of June 4, the Martin UAV “V-BAT”, a state-of-the art VTOL Fixed Wing UAV, launched from McMillan Field at U.S. Army Base, Camp Roberts in a flight test to demonstrate its calculated service ceiling. Twenty-five minutes later, V-BAT descended after easily reaching the upper limit of the restricted air space and its calculated service ceiling of 15,000 feet. After landing and a rapid payload change to an 8 lb. turret, the V-BAT was refueled and relaunched in less than an hour. The second flight was performed at a more tactical altitude and demonstrated the V-BAT’s capability of integrated flight with an Avwatch tracking antenna, successfully conducting ISR missions at ranges in excess of 50 miles. Both tests were performed as a part of the Naval Post Graduate School’s Joint Interagency Field Experiment 18-3 (JIFX), an event that provides government, industry and academic innovators the opportunity to collaborate and experiment with new technologies. Visitors look at the Martin Unmanned Aerial Vehicle V-BAT, Hohenfels, Germany, May 3, 2018. Various military and civilian officials came to Hohenfels to see how the Joint Warfighting Assessment 18 assesses solutions to warfighting challenges. HOHENFELS, Germany — A .50-caliber machine gun mounted on an Army Stryker vehicle? Very effective, but old school. The Joint Warfighting Assessment at Exercise Combined Resolve gave soldiers a glimpse of the future battlefield this week by combining standard ground-fighting tactics with prototypes like the Stryker Directed Energy system, a high-powered mounted laser. While the laser wasn’t yet operational, Army officials say it could be ready to shoot drones out of the sky within a year or two. The JWA tested 27 different concepts and capabilities at Combined Resolve, with input coming from some of the nearly 3,700 soldiers representing 13 nations at the exercise. The exercise is the culminating event for the 1st Infantry Division’s 2nd Armored Brigade Combat Team, currently on rotation in Europe. In the exercise, multinational forces had to counterattack a high-tech enemy while using both current fighting techniques and state-of-the-art equipment, including a prototype lightweight vehicle for airborne troops and newly developed drones. The laser, mounted on a Stryker chassis, would have fewer ammunition constraints and better range than current weaponry. The assessment also brought several new water systems to the exercise, including the Small Unit Water Purifier, a more lightweight, maneuverable water filter. The Army will analyze how soldiers utilized the new equipment and determine what needs to be done to improve it. “One thing armies always get wrong is understanding what a future fight looks like,” Lee said. “It’s human nature to look back on what used to work and how things used to happen, and it’s often not successful in the opening stages of a conflict. Martin UAV’s equipment independent V-BAT shines in the Army’s Combined Resolve 10 exercise in conjunction with Joint War Fighting Assessment 18.1. Martin UAV is an advanced technology company that specializes in building the world’s finest unmanned aircraft and associated flight control software. 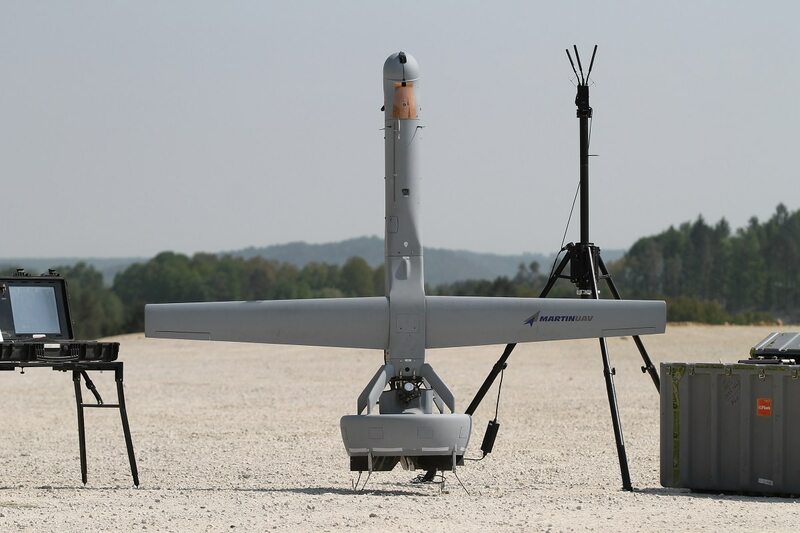 (Newswire.net — May 14, 2018) Plano, TEXAS — Hohenfels, Germany – Martin UAV’s ‘equipment independent’ VTOL UAS, the V-BAT, participated in the Army’s Combined Resolve 10 exercise in conjunction with the Joint War Fighting Assessment 18.1. The V-BAT supported the opposing force in its debut Army exercise along with the 2-1 ID at the Joint Multinational Readiness Center (JMRC) in Hohenfels, Germany. During the exercise, the V-BAT conducted numerous tactical surveillance and reconnaissance missions without the need of launch or recovery equipment as it highlighted its ability to seamlessly transition from vertical take-off to forward fixed wing flight. With a comparatively low acoustic signature on the wing, the V-BAT is also able to transition to a hover at any time during the flight based on mission requirements. Tactical scenarios included a confined area operation while demonstrating a field expedient build up to launch showcasing the expeditionary nature of this distinctive UAS. Other unique features include the safety of its ducted fan (no exposed blades), the intentional modularity and flexibility of desired payloads, and cost effectiveness made the V-BAT a highlight at the JMRC to include numerous distinguished visitors. The MartinUAV team appreciates all of the assistance of the Joint Modernization Command in order to make the integration and ensuing introduction of the V-BAT to the Army a reality. WASHINGTON — Martin UAV’s V-Bat, a unique vertical takeoff and landing unmanned aircraft, will take on the U.S. Army and its allies in the service’s upcoming Joint Warfighting Assessment in Germany in May, in which it will service as a part of the opposition force designed to challenge the service’s capabilities. The U.S. Army is holding its relatively new JWA — which evaluates emerging and gap-filling capabilities rapidly — overseas for the first time at the end of April into early May and has integrated the assessments into a few larger exercises taking place across training complexes at both Grafenwoehr and Hohenfels, Germany. For Martin UAV, this is a chance to show the Army that the V-Bat capability can be a tactical game-changer. The 84-pound drone (carrying a full payload and fuel) can stay on station for eight hours with another hour of reserve fuel, according to Heath Niemi, company vice president of global sales and development. It can reach dash speeds of 90 knots and has a range of 350 miles. It can also fly up to 15,000 feet. The drone is designed to be multimission-applicable, and payloads can easily be swapped out in the field. It takes roughly six to eight minutes to take a stored V-Bat out of its highly transportable case and assemble it, and a total of 19 minutes to get it airborne including loading flight plans into a ground control station, Blake Sawyer, Martin UAV executive vice president of global sales and development, told Defense News in an interview. In addition to not needing launchers to get the drone airborne or systems to catch it, the aircraft can also be refueled at the tactical edge. A two-person crew can control the drone, and training (including maintenance) takes four to six weeks. The drone can also be handed off from one controller to another, so it can be launched and then passed off to a controller elsewhere on the battlefield to be refueled without returning home, for example. The aircraft is uniquely suited for a wide range of missions such as forceable-entry. “You can imagine the 82nd Airborne mission set, a ranger battalion mission set or entering into denied areas,” Sawyer noted. When Martin UAV set out to build a new drone, the company asked if there was a way to build a tactical, true VTOL drone, not a hybrid that fills gaps between Group 1 (Puma and Raven) and Group 2 (Shadow) UAS and Group 2 and 3. And for the company, the answer is V-Bat. “If you can operate a Javelin missile in your infantry platoon or infantry battalion, you can operate V-Bat,” Sawyer said. Hybrid drones are designed for endurance and takeoff using electric power, which burns that power to become airborne. A hybrid drone requires a transition to horizontal flight needed to recharge in order to have enough power to land, Sawyer explained. But since V-Bat is more like a rocket in design than a traditional drone, it can transition to high altitudes and stay there; plus it has enough power to operate electric power-dependent payloads. While payloads have become smaller, the power requirements remain high; so smaller drones ― while capable of carrying certain payloads ― can’t power them. V-Bat has 500 watts of air vehicle power, which means it can accommodate a variety of payloads from signals intelligence to electronic warfare. Niemi and Sawyer said V-Bat would have the capability to fly in manned-unmanned teaming formations and could help serve missions beyond aviation such as supporting fires units with a laser designator-type payload to help with targeting. There is also interest in the system at the Army’s Maneuver Center of Excellence. Martin UAV plans to build one system that can be scaled from a Group 1 UAS to “theoretically” a 700-pound system that has a 100-pound payload, “all in the same design, same avionics, just different-sized aircraft,” Sawyer said. The company is pitching the drone to the Army at a time when the service is at a crossroads. The Army must determine how much longer it keeps its current fleet of both manned and unmanned aircraft flying before it begins to modernize in the form of acquiring brand new aircraft. The service has said for years that it doesn’t want unmanned systems that require a runway, but does want ones that can be easily and quickly deployed and recovered, even in the most austere environments. The service is also looking hard at a future tactical UAS for brigade combat teams as well as advanced UAS for its reconnaissance squadrons. UAS used for reconnaissance, security, target and acquisition capabilities are now very focused on using full-motion video, but the future focus will be more on an electronic warfare capability. Overall, the idea is for drones to do the dull, dirty and dangerous work on the future battlefield. The Army is conducting a technology demonstration for a future tactical UAS but is also looking across the other services to pull together promising efforts. But the Army will not wait for demonstrations and analyses to drive future procurement. If it finds something with great or truly disruptive capability now, it plans to move forward. Martin UAV LLC’s V-BAT tail sitting VTOL Fixed Wing UAV sets second record with more than 9 hours of endurance on February 13 from Yuma Proving Grounds. The endurance flight was part of a series of tests conducted at Yuma Proving Grounds in support of a Cooperative Research and Development Agreement between the U.S. Government and Martin UAV. Martin UAV’s V-BAT, a tail sitting VTOL fixed wing UAV, launched last Friday morning on a routine flight test and landed 8.1 hours later. (Newswire.net — February 2, 2018) Plano, Texas — The Martin UAV “V-BAT”, a breakthrough tactical, tail-sitting VTOL fixed wing drone with multi-mission capability, launched early Friday morning on a routine flight test and landed 8.1 hours later with more than an hour’s fuel remaining in the gas tank – conclusively demonstrating its ability to exceed the currently published endurance of 8 hours. Phil Jones, Martin COO & former RAF Tornado & MQ-9 Reaper pilot commented, “This marks another major milestone on the road to providing the warfighter with a multi-mission, long endurance, tactical, and truly expeditionary ISR platform that doesn’t require the burdensome launch and recovery systems of others in this class. A true VTOL (not a hybrid), V-BAT is capable of mid-flight transitions and is fully FARP-capable, making it wholly unique in the global marketplace today”. Los Angeles, CA – Worldwide Business with kathy ireland® announces an exclusive interview featuring Martin UAV. There is a growing demand for access to cost-effective unmanned aerial systems for a variety of purposes within a wide range of industries. Martin UAV is meeting this demand by offering custom unmanned aerial systems for the purpose of law enforcement, first responder applications, military needs, aerial mapping, photography needs, agricultural mapping and much more. The mission of Martin UAV is to provide their customers with cost-effective access to aerial information. They specialize in providing versatile and robust Unmanned Aerial Systems that will support even the most demanding collection needs. The technology currently being employed by Martin UAV has been decades in the making, representing years of development and research. This means the UAV products provided by Martin UAV are on the cutting edge in terms of performance and technological advancements. The 337-foot USNS Spearhead transport ship is back in Truman Harbor through next week preparing for a trip to Latin and South America as well as testing a new asset — a drone that takes off and lands vertically. The Spearhead visits Key West regularly as it is often tasked with supporting Joint Interagency Task Force South based near Truman Waterfront as well as conducting humanitarian missions to Caribbean nations, but this visit is a little unique. Navy Lt. Rick Moore and Martin UAV Vice President for Programs Wayne McAuliffe displayed the Texas based company’s 9-foot tall drone that will be assisting in gathering intelligence while at sea. “It’s a very versatile platform and will help us carry out more missions, such as maritime security and supporting JIATF South,” Moore said. The drone has an 8-foot wingspan and is relatively light at roughly 82 pounds. It only needs a 15-foot by 15-foot space to take off and land, McAuliffe explained. The drone being used by the Spearhead crew is outfitted with cameras and sensors, but the drone can fly up to eight hours with any standard 5-pound payload. It is not a weapons platform, McAuliffe said. Moore said the Spearhead will also be visiting several Latin and South American countries as they continue to increase inter-operability with partner nations. The drone testing is a small part of their larger mission. “We have a medical and construction element and will be drilling some wells for water as well as conducting dive training with our host nations,” Moore said. The Spearhead takes part in the Department of Defense’s annual mission called Continuing Promise 2017 that seeks to foster stability and enhance the collective ability of the United States and its partner nations to respond to natural disasters and humanitarian crises. The Spearhead was last in Key West in February where it was loaded with medical, dental and veterinarian supplies near the Outer Mole Pier bound for Guatemala, Honduras and Colombia. The ship has a civilian crew of fewer than 30 people. Though the Spearhead crew is mostly civilian, the vessel itself is part of the Military Sealift Command, the portion of the Navy that oversees transport vessels. There are Naval officers on board who oversee the military element of the ship’s mission. Moore said the Spearhead will likely remain in Key West through next week. An exercise taking place this month at Camp Pendleton is designed to help answer a simple question: how to mount an aggressive beach invasion while risking fewer U.S. Marine lives in a time when technology almost ensures that the enemy will see everything that’s coming at them. Video – The Advanced Naval Technology Exercise is taking place this month at Camp Pendleton. On display in the air, sea and land were more than 100 high-tech tools the U.S. Marine Corps. is considering for future warfare use. Those tools included flying drones of all shapes and sizes, unmanned ground vehicles that can start a beach assault with a machine gun controlled from half a kilometer away, and submersible robots that scour the shallow waters near shore searching for mines and other obstacles. “It’s focused on first wave and mostly focusing on unmanned systems with a big emphasis on intelligence gathering, surveillance and reconnaissance,” she said. “What we’re doing here is marrying up technologists from industry, academia and government labs with the guys who actually develop the operation concepts for the Marine Corps,” added Marine Lt. Col. Jim Foley. The event was reminiscent of a huge trade show with hundreds of millions of dollars worth of military contracts potentially at stake. Each afternoon some of the tools were put into practice during a faux amphibious landing in which the waters were scanned by air and sea by drones and robots that looked for mines and gauged the currents and wave heights. The unmanned ground vehicles were then brought in to set up on the beach and perhaps begin the fight. Information was being relayed from above by flying drones of all sizes and shapes. “Some of the vehicles that in the past were piloted by actual people are being remotely operated so the first things that hit the beach won’t be manned, they will be robots that can breach or go through obstacles,” Foley said. The Multi-Utility Tactical Transport family of vehicles — (MUTT) which are various sized supply carrying vehicles that can be put on the beach in advance of troops. They can also be turned into a weapon by mounting a M2 .50-caliber machine. “It would take five guys to take the .50-cal downrange. One guy can do it here and he can remotely control it. So now you look like a big force and the enemy won’t know.” said Dan Rodgers of General Dynmacis Land Systems. The RAZOR Biorobotic Mine-Hunting UUV — “This thing swims sort of like a sea turtle with four flapping fins that can do low-speed maneuvers” which is ideal for doing widespread mapping of a minefield, said David Beal, engineer with the naval Undersea Warfare Center in Newport. Tracy Conroy, experimentation director for SPAWAR Systems Center PACIFIC, said events like this used to be commonplace but since the wars in Afghanistan and Iraq, where amphibious landings played little role, the Marine Corps had gotten away from such things. “The purpose of this exercise is to see what has happened in the past 14 years, what new technology is there, to help improve and enable the Marines to get ashore quickly, safely, quietly and get them back to the ships,” he said. He said in the future drones and man will work together as one unit, one team. Fenix Group, a private VA based technology firm, has partnered with Martin UAV, a Texasbased manufacturer of rugged utility drones to launch the world’s first drone capable of providing fully functional 4G cell phone service. The feat may be a world’s first, and the company sees huge potential for government and industry with the flying cell phone tower, weighing in at under 55 pounds. “When we first conceived the project, we knew we had to make it a priority,” said Dave Peterson, Fenix Group’s President & CEO. While Fenix Group’s focus is in providing technology & direct support to DoD and partner forces worldwide, the utility for a flying cell phone tower – complete with subscriber database & billing functionality, means connectivity in the most remote parts of the world. (Learn More about Martin UAV capabilities, courtesy of Martin UAV and YouTube)In addition to providing a coverage area on the ground, the payload is also able to stream encrypted video from the drone’s camera system to anyone on the network. In the future, soldiers, search and rescue teams, and first responders will have access to drone video from their phones. Th e Fenix team even went so far as to enable Internet access so that command centers could access the feed from anywhere in the world. “The technical challenges we faced to get all of the components to play nicely and not cause the aircraft to crash were very real,” stated Stefan Schaner, Fenix Group’s Chief Innovation Officer. While Fenix Group plans to issue its first production units to DoD & first responders, the Virginia startup anticipates high demand from telecom providers, oil & gas companies, and crisis response units worldwide. SAN DIEGO, Calif. (March 1, 2017) – Today, VStar Systems Inc., a privately held aerospace and defense systems company, announced the successful flight test of its modular Signal Intelligence Sensor, MA-C/lite, aboard the Martin UAV V-Bat aircraft. Over the duration of 35 minutes at an altitude of 400 feet above ground level, MA-C/lite collected signals from as far as 20 miles distance. MA-C/lite provides never before seen capabilities to Martin UAV’s V-Bat fleet, enabling the aircraft to fulfill new, critical missions for a variety of military and private security clients. Founded by entrepreneur and U.S. Navy veteran Andy Von Stauffenberg, VStar Systems designed its MA-C products to provide signal intelligence such as signal copy, signal identification and geolocation to a wide variety of platforms, ranging from Type 1 UAV’s to even the largest manned platforms. 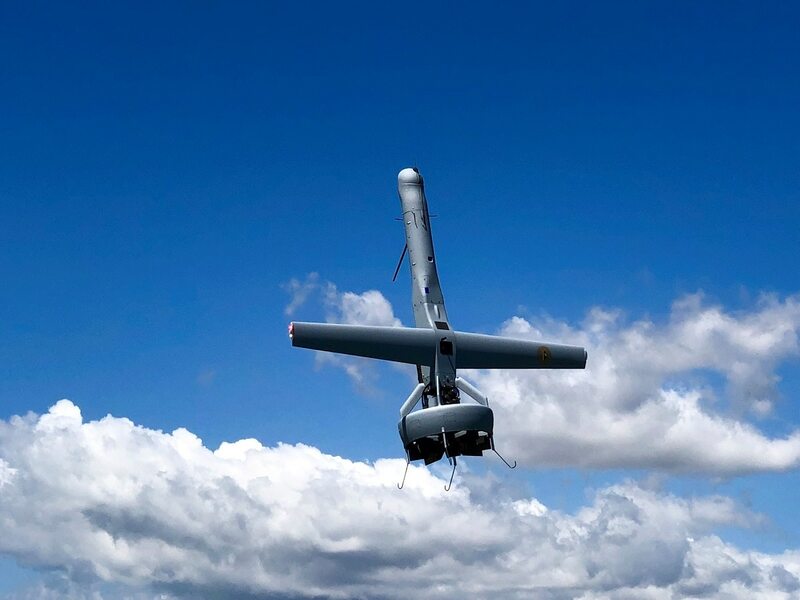 Starting at a weight of approximately 2 lbs., MA-C/lite provides SIGINT capabilities to Martin UAV’s line of V-Bat drones, which previously were limited to optical payloads due to size and weight of other SIGINT sensors on the market. MA-C/lite is one of several products under the MA-X Modular Airborne Signal Intelligence System, a scalable solution designed to provide critical intelligence at a more affordable price point. The launch of the MA-C/lite sensor is VStar’s first step in commoditizing SIGINT – allowing smaller aircraft to carry a single, specialised module rather than extra weight and associated costs from a sensor that does more than required for the mission. VStar provides a convenient and efficient system that requires low size and weight, and comes at a low cost; ultimately bringing more players and ingenuity into the UAV industry as more aircraft utilizing VStar’s sensors will be able to fulfil critical the tactical and strategic missions that commanders have been struggling to complete. With a successful first flight test complete, and several additional tests to increase the capabilities already planned, VStar’s MA-C Sensors will become available as a payload option on the VBat later this year. For further details about the full MA-X system and/or inquiries, visit the VStar Systems website at vstarsystems.com. Martin UAV LLC, a Texas-based unmanned aerial systems (UAS) company with advanced engineering offices in California’s Silicon Valley, is participating in the 2016 UNITAS near Panama City, Panama. UNITAS is an annual multi-national exercise involving more than 10 partner nations. At the invitation of the U.S. Naval Forces Southern Command & U.S. 4th Fleet, the company’s flagship vertical take-off and landing (VTOL) aircraft, the “V-BAT”, successfully conducted both interdiction and humanitarian operational exercises on land and at sea. The V-BAT demonstrated flawless hand-off to shipboard control and VTOL capabilities never before achieved in an operational environment. The Martin V-BAT is the first aircraft of its size and capability to successfully demonstrate the ability to takeoff vertically, transition to wing-borne flight, and land from a hover. The V-Bat is capable of hovering over select locations along a pre-programmed flight path before returning vertically to land or sea landing locations in highly confined areas. With a near zero footprint, V-BAT is ideally suited for maritime operations without disrupting manned aircraft flight on or below deck. Unique in the UAS marketplace, V-BAT does not require the assistance of launch or recovery equipment. Martin UAV LLC, a San Jose, California based designer and fabricator of unmanned aerial systems (UAS) recently participated in the 2016 Joint Interagency Field Experimentation (JIFX) event at Camp Roberts, California, at the invitation of the United States Naval Post Graduate School. The company’s flagship vertical take-off and landing (VTOL) aircraft, the “V-BAT”, conducted operational flights from a remotely confined area as well as a prepared runway at the United States Army’s test range. The Martin V-BAT is the first aircraft of its size and capability to successfully demonstrate the ability to takeoff vertically, transition to wing-borne flight like a sail-plane, and land from a hover The V-Bat is capable of hovering over select locations along a pre-programmed flight path before returning to land vertically in a concealed and confined area. The V-BAT has achieved the critical operational benchmark of vertical take-off and landing without the assistance of any launch or recovery equipment, making it unique in the UAS marketplace today. Pictured below is the production V-BAT gas-variant, the culmination of rapid innovation under globally-renowned aeronautical systems expert, and Martin UAV Chief Technology Officer, Dr. Stephen Morris. JIFX is an invitation-only annual event which took place August 9-10, 2016. The testing provides combatant commanders, as well as state, local and federal agencies an environment in which they can rapidly test, evaluate, and refine emerging technology in support of warfighters and first responders. Poachers in Tanzania’s Tarangire National Park will face a new foe after the African nation’s park service announced a new drone patrol this past month. Tanzania’s Ministry of Tourism approved the use of UAVs over the park’s 1,000-square-foot domain following a trial deployment at Mkomanzi National Park. The park is one of Africa’s most verdant preserves in terms of biodiversity and is especially known for its elephant population. Park law-enforcement will patrol the region using Super Bat DA 50 drones by Martin UAV. The fixed-wing aircraft has a 15,000 flight ceiling and can cover a 6-10 mile radius with a fuel range of 450 miles. Bathawk Recon, a Tanzanian UAV startup, will operate the fleet. The anti-poaching initiative may run afoul of current national policy, however. In 2014, Tanzania’s national park service, Tanapa, declared that “the use of the UAVs of different sizes for any purposes is not allowed in the national parks for security reasons.” Ironically, the agency feared that poachers could use drones to scope out prey. It’s not yet clear if the Tarangire project will receive a government waiver. Over the past six years, more than 80,000 Tanzanian elephants have been slaughtered for their ivory. Drones have become one of the most promising weapons worldwide in the war on wildlife poaching. More recently in South Africa, the Directorate for Priority Crime Investigation worked with state-owned tech firm Denel Dynamics on a UAV solution to battle rhino poachers in Kruger National Park. Readers can learn more about conservation efforts driven by drones here. Arusha — Tanzania has authorised the use of drones in Tarangire National Park in a hi-tech battle against poachers who threaten the country’s multi-billion dollars wildlife tourism industry. This operation will be carried out by Bathawk Recon, a Tanzanian start-up intending to develop and deploy this technology in countries affected by poaching. Bathawk Recon director Mike Chambers says UAVs are the surest way of the future as the cost benefit is hugely advantageous. “We have selected the Super Bat DA-50 made by Martin UAV in the US in the six month operation that will include, a fully functioning operation, fully trained operational personal and a ranger protocol program” Mr Chambers told BusinessWeek here. According to Mr Chambers, this kind of drone has day and night capability which will enable surveillance to be deployed any time, any place in the protection area leaving no place for poachers to hide. “This will enable us to survey greater areas and protect larger parks and reserves. The concept will find poachers and illegal intruders and lead rangers to the location.” Mr Chambers explains. Bathawk Recon’s plan for the Tarangire is to establish UAV anti-poaching as a viable technology and the best choice for wildlife protection aerial surveillance. The Unmanned Aircraft Systems Sciences program at Embry-Riddle Aeronautical University has received a generous donation of four MartinUAV Super Bat unmanned aircraft systems (UAS) from BOSH Global Services worth over $260,000. Embry-Riddle’s Daytona Beach Campus has the largest baccalaureate UAS program in the United States. BOSH Global Services is a world leader in UAS command, control, communications, computers, intelligence, surveillance and reconnaissance services. The Super Bat is one of the most sophisticated small unmanned aerial vehicles (UAV) flying today. It is part of a complete unmanned flight system that includes ground stations, launchers, accessories and components. The system is being used in the United States for aerial missions such as airborne law enforcement reconnaissance, wildfire monitoring, agricultural crop analysis, atmospheric science research, disaster reconnaissance and emergency management. Martin UAV signs Cooperative Research & Development Agreement (CRADA) with the United States Special Operations Command for creative research & development of a specialized variant of the Martin UAV V-BAT UAS. Martin UAV honored to serve as a sponsor for the AUVSI Unmanned Systems Defense Conference in Pentagon City (Arlington, VA). The Martin UAV team featured the V-BAT system, a wholly-unique V-TOL system that is ideal positioned to fill a critical mission gap in today’s “warfighter” community. 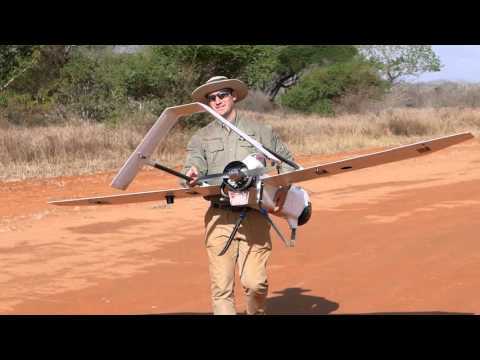 Martin UAV’s Tanzanian Anti-Poaching Success! Martin UAV LLC and Aviation Unmanned LLC, out of Addison, TX successfully deployed two of its renowned fixed-wing unmanned systems in support of Bathawk Recon and the Tanzanian National Park Authority (TANAPA). Bathawk Recon, a Tanzanian UAV Anti-Poaching surveillance company, hosted the trials, which featured the American made Martin UAV “Super Bat” from the 12th to the 16th of September. The rigorous trial evaluation and associated metrics were designed to determine if the gas-powered, long-endurance UAV could meet Bathawk’s anti-poaching concept requirements. After five rigorous days of flying, the Super Bat proved its prowess by hitting every target, something none of the competing UAV’s were able to accomplish. The combined team, made up of Martin UAV, Aviation Unmanned, BatHawk Recon and TANAPA, put the Super Bat through its paces over five days testing sound, the effectiveness of the sensors, range, endurance and operating in support of park rangers. The Super Bat, even while operating at the maximum altitude agreed with civil aviation, could detect people, follow them through the bush, zoom in on game and do it all in both in Video and Infra Red. Along with a highly effective sensor payload, the aircraft’s range and endurance were confirmed at an impressive 30 kilometers distance and eight hours in the air. UAV anti poaching surveillance projects are being developed in a number of African countries such as South Africa, Namibia and Kenya. However, there is still some controversy on their effectiveness. Bathawk’s position is that UAV surveillance is certain to be the most cost effective and, in the end, will be widely used in anti poaching. After multiple aircraft evaluations by BatHawk, the Martin UAV Super Bat has proven viable to support ongoing operations. This is a landmark achievement for Martin UAV and a testament to robust, experienced engineering and ground breaking technological advances in the medium UAV market. Martin UAV is a private company manufacturing Unmanned Aircraft systems (UAS). Aviation Unmanned is a private company providing UAS services and training. Martin UAV of Dallas, Texas is pleased to announce the acquisition of MLB Company of Santa Clara, California. The acquisition brings the world’s most experienced UAS operators together with the exciting team of innovators at MLB Company. The technological expertise of Dr. Steve Morris will continue with research and development in California’s Silicon Valley with plans to develop manufacturing in Texas in the coming year. The Federal Aviation Administration has begun to allow commercial drone operations. Recently the use of the Martin UAV Super Bat aircraft was authorized for commercial operations. With many companies looking to exploit this cutting edge new technology, Martin UAV will be well placed to meet increasing demand for aircraft. Martin UAV is a Texas based unmanned aerial systems manufacturer providing exceptional unmanned aircraft systems. Its strong performance, reliability, rugged design and value to the market will be further enhanced by this acquisition. Our team is built around accomplished engineers with decades of experience in the industry. The company will offer existing Super BAT and BAT-4 aircraft systems as well as complete the development of the innovative V-BAT VTOL aircraft by 2016.